Dr. Alex Jarrett and our team offer leading-edge, gentle dental care for your family. We’re experienced, ethical, and patient-focused in all we do. Our goal is to help you achieve your healthiest, happiest smile and teach you how to care for it. We want you to have a lifetime of beautiful smiles! Dr. Jarrett will ask lots of questions about your treatment goals and concerns. The better he understands your desires, the better he can exceed your expectations. Your treatment plan will stress preventive care and conservative treatments that deliver the best results. Our office is equipped with advanced dental technology, and Dr. Jarrett uses the latest techniques. Those, combined with the essential human connection, ensure you’ll be smiling throughout your visits! In addition to dental exams, cleanings, and fillings for all ages, we offer pediatric and cosmetic dentistry, as well as emergency dental care. We also provide bridges, crowns, and dentures along with root canals, extractions, and wisdom teeth. Since we understand that some people experience dental anxiety, we work at a speed you’re comfortable with, explain each procedure, and fully answer your questions. You have the right to be informed and will never feel rushed! Ours is a dental practice where everything is about you: your comfort and goals are important to all of us. We want to help you preserve your natural teeth and achieve a functional, beautifully unique smile that’s healthy and confident. We take time to really get to know our patients. We want to learn about your family, life, and activities. Your visits will be a time to catch up with a friend and make sure your smile is doing well. We’ll also spend a lot of time talking about your unique oral health. We’ll explain your specific concerns, review proper home dental hygiene, and encourage you to take control of your smile’s health. 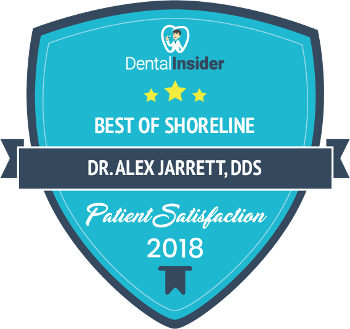 Our Shoreline, WA dental office serves the communities surrounding the North end of Lake Washington. Please contact us to learn more and schedule a visit for yourself or a loved one. Dr. Jarrett and our team members can’t wait to meet you. We’d love to be your dental care partners, and help you achieve a lifetime of wonderful smiles!